Hello there! Today I am playing with alcohol inks for the very first time to create watercolor-like backgrounds for clean and simple Fall cards. Alcohol inks have been around for a very long time, they were very popular several years ago when I was just getting into cardmaking. Honestly, I never understood the whole alcohol ink hype, I didn’t really like the look of alcohol inks, it wasn’t something that appealed to me, so I stayed away. This Summer I watched a few videos showing a different kind of use of alcohol inks, a different end result, and I really wanted to give them a try. I also had a few comments on my community page suggesting I film a video with alcohol inks, so here we go guys. If you’ve never used alcohol inks before I hope you’ll enjoy this video and hopefully will feel inspired to try them in your crafting. 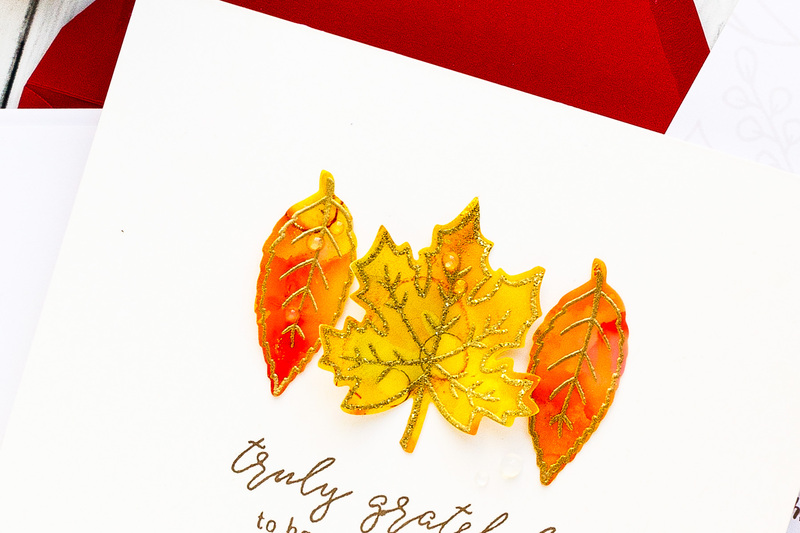 My inspiration for the alcohol ink background today came from the new Fall Foliage stamp set from Reverse Confetti. 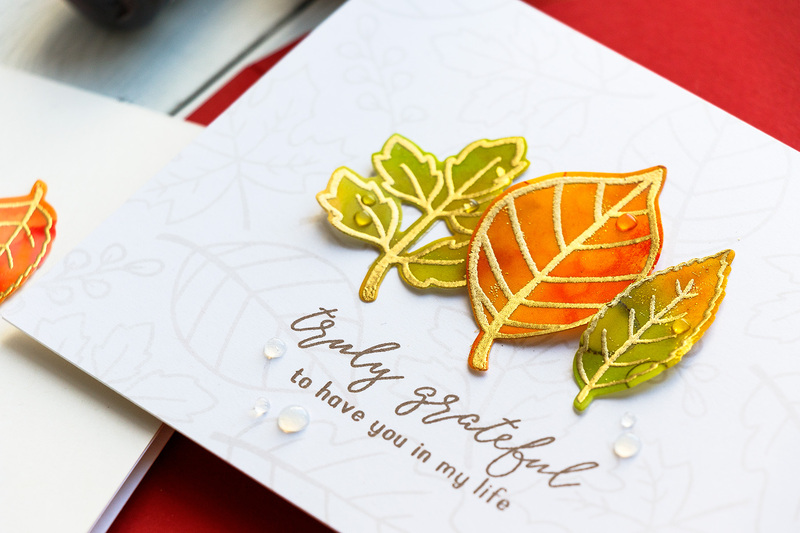 I loved all of the different leaf shapes featured in this set and I wanted to try a different, new to me, way to color leaves to have realistic Autumn foliage without spending too much coloring each individual leaf. This brought me to the idea of using alcohol inks. I used translucent Yupo paper from Ranger and several colors of alcohol ink: Flamingo, Coral, Limonchello, Dandelion and Valencia. Prior to applying inks onto my paper I pre-wet the paper with 70% alcohol. This gave my alcohol ink background a different, softer, almost watercolor-like look. Alcohol ink is very unpredictable and you’ll never get the same results twice no matter how hard you try. 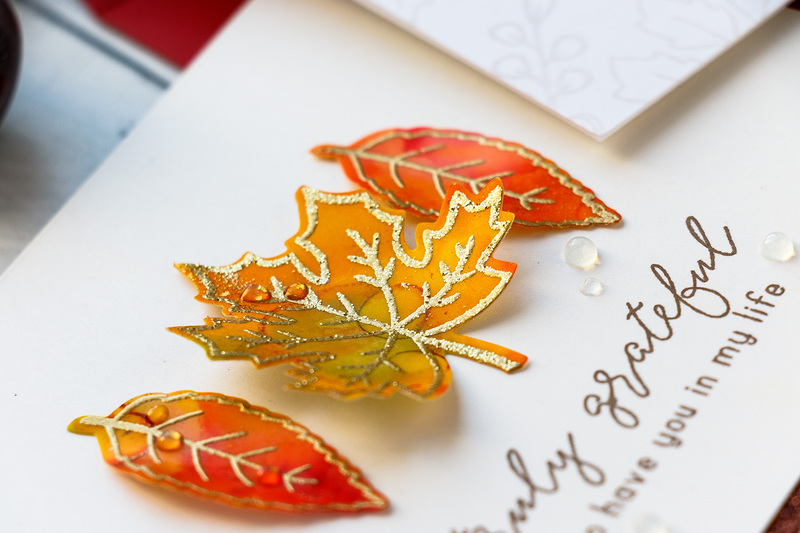 After finishing my alcohol ink background I heat embossed several leaves from the Fall Foliage stamp set in Gold and Gold Glitter embossing powder from Hero Arts. 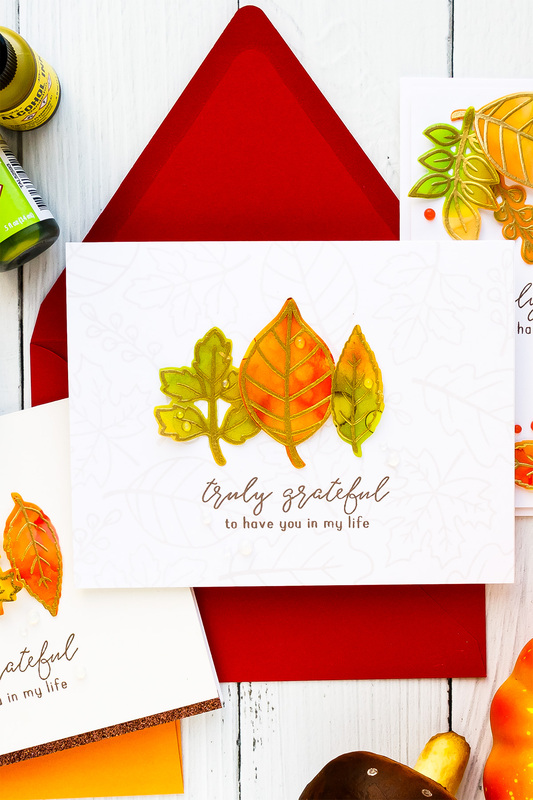 I cut my leaves out with the help of coordinating dies and used them to create several Clean & Simple Fall Gratitude cards. These are so gorgeous, Yana! Wow! These are stunning! I love the effect of the alcohol inks! And then the gold glitter embossing and the subtle stamping in the background—-so gorgeous!!! Fantastic technique! Love the simplicity of the cards, just beautiful. Beautiful cards. Thanks so much for showing a technique using alcohol inks. First of all, I love your stories. It’s so nice to get a glimpse of the life of someone I admire. I love playing with alcohol inks, but I used to think they were just for backgrounds. I was always a bit disappointed with the final result. After your video I realize that I can emboss and die cut from these “background fails” and possibly create something beautiful — at lease I’m going to give it a try! Your leaves are gorgeous. I’m a fall gal. I love the gold embossing. Beautiful leaves and so simple! Gorgeous cards! They’re so simple yet so elegant. 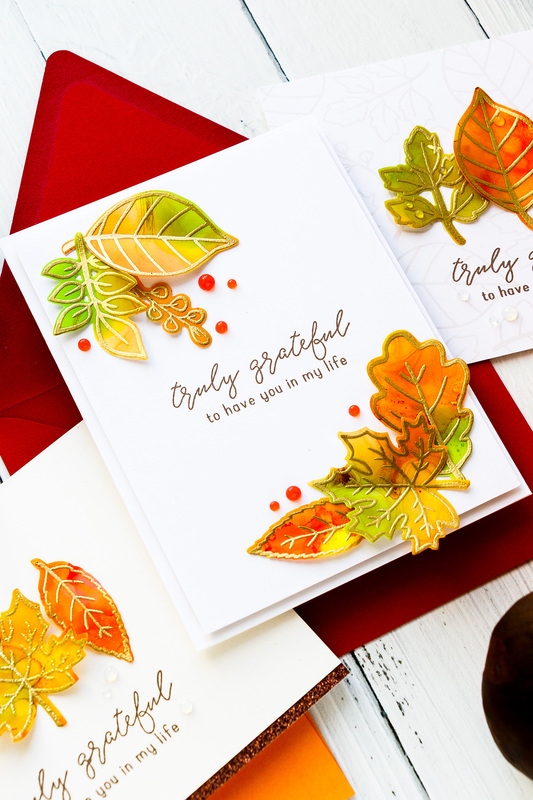 The deep fall colours along with the gold glitter embossing makes for a stunning card! Congrats on your alcohol inking!!! Cards look great (especially the one with the sort of ghost stamping background. Very elegant looking. Playing with alcohol ink has been a slow process for me and discovering how to use the outcome (die cutting, using strips, alcohol ink lift(!!!! ), etc.) has really inspired me to use them more. Thanks for the video. P.S. Found another great paper for pencils!!!! Strathmore 400 series designed for colored pencils. It’s white and lots of tooth!!!! I’m a happy camper!!!!! So, so pretty! Yes, I like hearing the tidbits of your life, especially since you are in another country, I think it’s fascinating. Beautiful cards. I love watching your videos and hearing the little life tidbits at the end. Gives me a bit of insight where your creative ideas come from. Your new apartment colors sound fabulous. 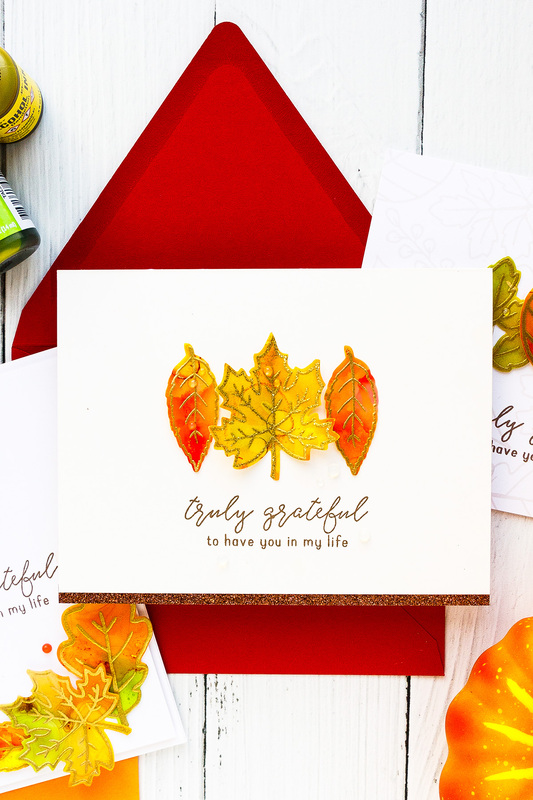 Love these gorgeous fall cards, YAna, & the great video also! Thanks for sharing! I love all of these cards. I’ve been using alcohol inks for years, but havenot used Yupo b/c I still had a huge stash of Krome coat paper. I’ve saved all my backgrounds and use them often for smaller die cuts. 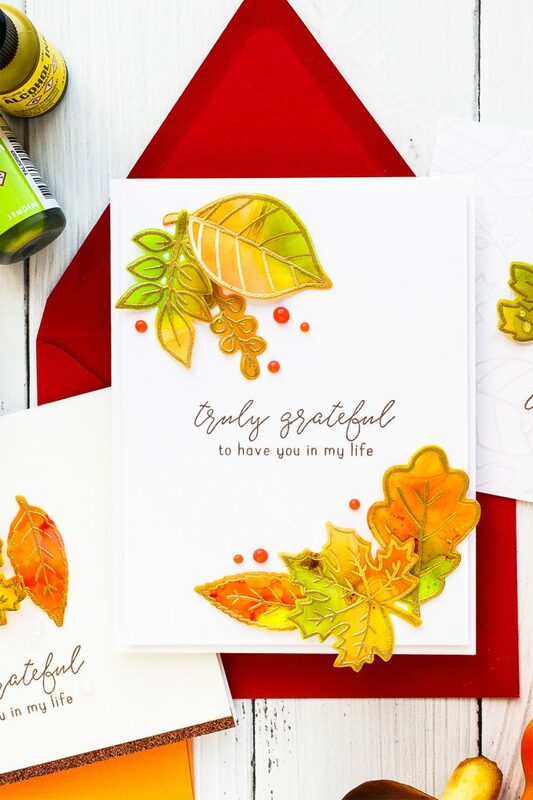 This Fall foliage stamp/die set is my favorite in this release. I, too, love lots of color in my house. When we sold our home two years ago, I knew I would miss those colors and saved all the paint stir sticks with the color #s. But we bought a home with completely different colors, all of which I’ve grown to love except for one room. Happy painting. 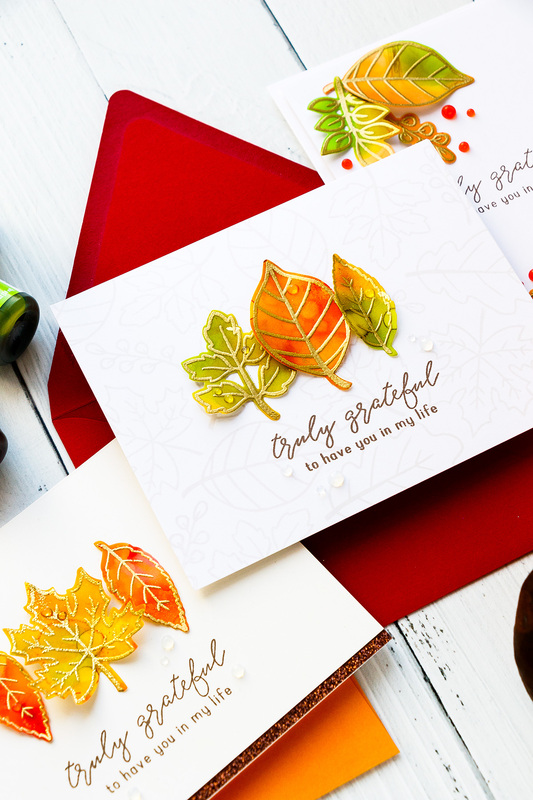 I love these Fall Foliage stamps! You did a great job with your first alcohol ink foray, the cards are gorgeous. Lovely, that gold embossing looks very rich with the paints! Scrumptious colors on these beautiful cards! Love the Fall Foliage set! Love your videos and hearing about what you are up to. It is. Nice personal touch. 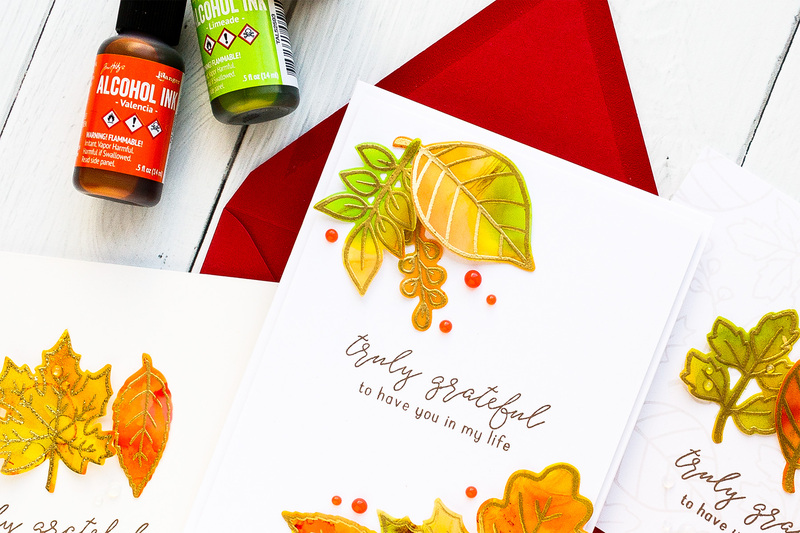 The alcohol ink with the leaf patterns looks incredible. What great colors the alcohol inks produce for these leaves! tfs on this blog hop. Absolutely gorgeous cards! Fabulous clean designs and stunning colors. Gorgeous cards and stamps! I haven’t tried using alcohol inks yet, but you sure have inspired me to do so! Always such beautiful work Yana. Would you mind sharing where you get your beautiful red envelopes. Many thanks. thank you, Louise! These are by Simon Says Stamp – http://shrsl.com/15r7g. I love all of their V-flap envelopes! These are gorgeous.. I love the simplicity. 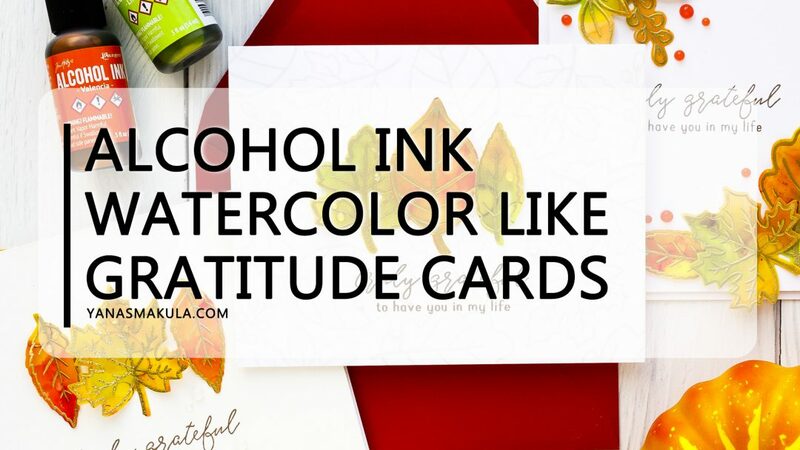 Thank you for sharing another great way to use alcohol ink projects. The personal tidbits are a great addition. I love your color choices for your home. Great video and very professionally done. Thank you for sharing this technique and the gorgeous card.